What to do in Gulf Shores/OBA during the fall! Although it may not feel like it, fall is here and with fall comes festivals, food, and fun! The usual laid back vibe of Alabama’s beaches are still present, just with an added dash of pumpkin spice. So grab your kiddos and a latte, and gear up for everything the beach has to offer in October! 1.) 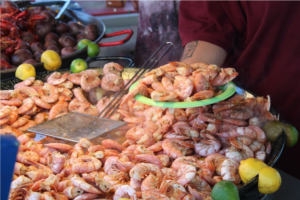 The 47th Annual National Shrimp Festival Oct. 11-14, 2018: Savor fresh from the Gulf seafood at the 47th Annual National Shrimp Festival during this four-day event from October 11-14 that attracts over 300,000 people. This year the festival will play host to more than 100 hours of musical entertainment featuring a lineup of national, regional and local acts. 2.) The Original German Sausage Festival Oct. 27, 2018: The Elberta Sausage Festival makes its semiannual return to that South Baldwin hamlet. Held in Elberta Town Park, just north of the town’s only stop light on Hwy. 98, the event attracts up to 20,000 revelers, according to organizers. A 40-year tradition, the festival attracts a cross section of the community in what has become a reunion-type atmosphere. It is also the main revenue source for the area’s volunteer fire department. 3.) Trunk R Treat at The Wharf Orange Beach Oct. 31, 2018: Spend your not-so-haunted Halloween on Main Street at The Wharf for a night of seasonal delight for the whole fam. Whether you come as a goblin, ghoul, or Ghostbuster, make sure you dress to impress. There will be a costume contest for all the festive folks and kid’s activities galore! Don’t be a scaredy cat – join in for a safe, candy-filled good time. Also, don’t forget you can always end your October with one of our many cruises. We’d love to have you this fall!